A month has passed since the EuroCosplay Championship Finals at the MCM London Comic Con! This year, Cyprus Comic Con’s Cosplay Competition was officially named as the national preliminary of EuroCosplay and our first place winner, Nyree Hapetian (Manic Crafts) was selected to represent Cyprus in the EuroCosplay Championships. 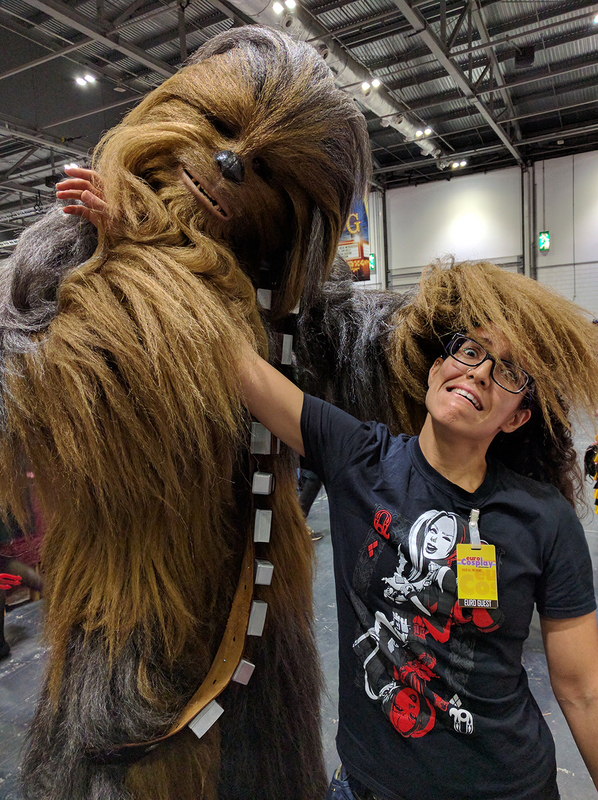 We are thrilled to get to have a chat with Nyree after the competition to get the insight on what it’s like to participate in one of Europe’s largest cosplay events, as well as to compete amongst some of the most incredibly talented cosplayers from every corner of the world! Hi Nyree, we hope you’ve had enough time to let this amazing experience sink in! First of all, tell us how it felt to receive first place prize at CCC16’s Cosplay Competition and finding out you were going to represent Cyprus at EuroCosplay. What first made you want to get into cosplay and how long have you been cosplaying for? Honestly it just looked like great fun and I wanted to try my hand at it as I already enjoy making and crafting things, it was a new area I wanted to experience. I have done one cosplay for each of the CCC’s so far. So, three costumes all together. How much experience have you had with cosplay competitions so far? Can’t say a great deal as CCC is also in its infancy, EuroCosplay was definitely on a whole new level and I could say my real taste at what a professional competition is like. EuroCosplay was the first international cosplay competition you participated in, how was that experience for you? Did you get a chance to talk to some of the other cosplayers there? As I mentioned earlier, it’s on a whole new level. I could only guess and assume at how it would be but it was so much more, the standards are super high and I noticed this as soon as I walked into the backstage rooms and saw everyone unpacking their costumes; just from that, I could tell the high level of professionalism. I had a chance to talk to some of the other cosplayers and it was very exciting and a great learning experience! Talk to us about the judging process. How did you mentally prepare for it the last few hours before stepping in front of the panel of judges? Well I didn’t leave it for the last few hours to prepare (laughs), thankfully they had told us prior how the judging would take place so we had plenty of time to prepare our talk to explain to the judges how we made our costume etc., so there was nothing to really worry or stress about. Can’t say the same for the stage performance however! I assume that it’s always stressful because going in front of hundreds of people and literally being the centre of attention is not something one does every day! Are you pleased overall with your performance and presentation at EuroCosplay? At the time yes, I believe I did the best I could at both presentation and performance. There is always room for improvement in all areas and being at EuroCosplay gave me a good idea on how and where to improve. 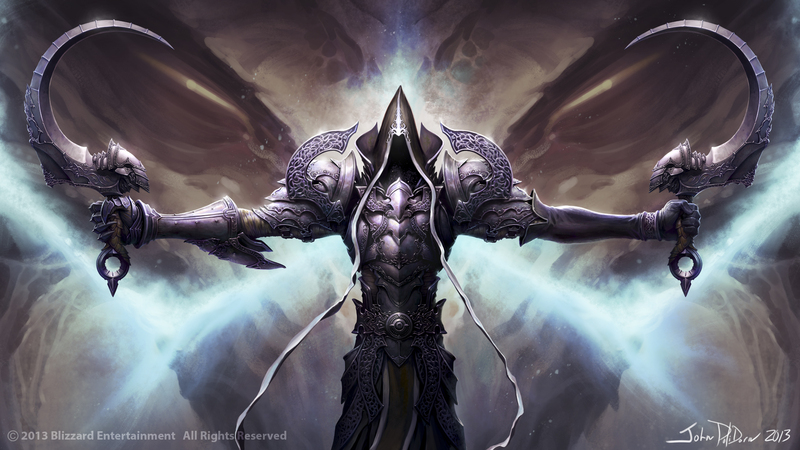 What was the process of making Malthael (Diablo III) like? How long did it take? Basically as with anything it starts with planning. After deciding on Malthael I had to analyse the costume and decide on what materials I could make it with. Since I’m still kind of new to this all, I also had to do a fair bit of research on how to work with the materials. Then I drew out a plan of how many pieces I would need and how to make each and then got practising. It took me around three months, this involved learning how to use this foam and practising different techniques before making the final pieces. What were the biggest challenges you faced while making your costume? Learning as I went along because half the time I was just thinking “What on earth am I doing/supposed to do” Best way to learn some would say – jump right into it. Let’s talk about ‘Manic Crafts‘. You created a page for your cosplay creations where you also post your personal drawings. What are some of your goals with Manic Crafts and do you have any new cosplay projects currently underway? It’s just where I post anything new I’m creating for now really, it’s nice getting support from people who are also into the same things or just interested to see one’s work. Maybe someday it will grow and move to a more professional, well-known level. Currently I don’t really have anything planned for sure but I will definitely start practising more on prop and armour-making just to hone my skills. How do you go about your research when designing a costume? First I try to find as many reference images as possible. I personally prefer using official sources such as official character concept art or screenshots from the games or movies instead of looking at other cosplayers, because everyone adds their personal touch to a costume. I then take a good look at the character and the design of the costume. 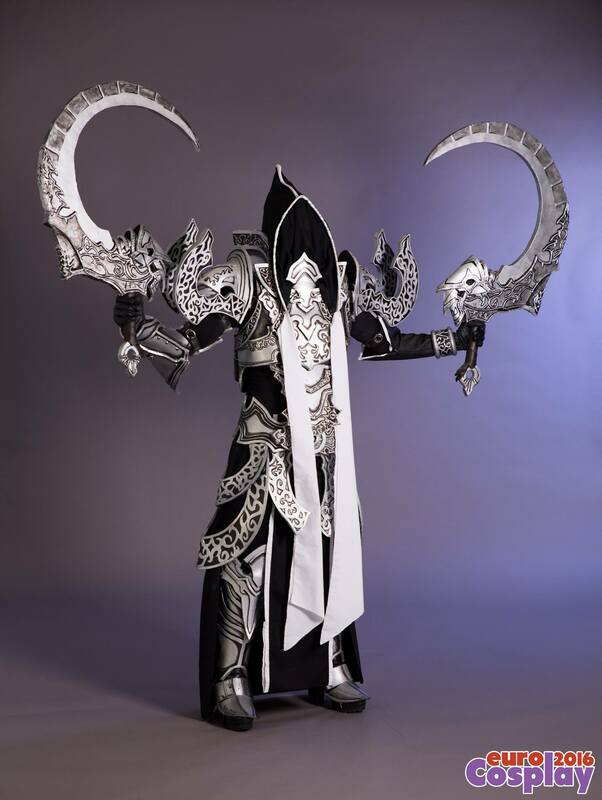 For example Malthael’s costume consists of mostly armour and it also has a skirt and hood. The armour is almost full-body, so it required plenty of material to make, but at the same time it had to be lightweight so as to not weigh me down. Deciding on what materials to use, also depends on availability, if not how much time it will take to ship it over and how much it costs. Afterwards I had to decide how to do all those small details on the armour itself as well as the painting of the costume and any other materials and tools. Same ideas go for the fabric, is it a heavy or flowing fabric, does it have a pattern? Do you have any favourite materials to work with? I’m still a newbie at it but I would say my favourite so far is EVA foam as it’s so versatile. Where did you learn your crafting techniques? Any new techniques you would like to delve into in the future? Just trial and error really, researching what I could and trying different things, seeing what works what doesn’t, wanting to try different things. As for new techniques I would like to get into sculpting/casting as it opens up new possibilities that can’t be achieved, or at least that well, otherwise. Watch Nyree’s stage performance as Malthael! Perhaps one of the most challenging aspects of cosplay is portraying the character on stage. How far into the character are you able to go and what helps you connect and transform into that role? This is indeed challenging, but it also depends on the character itself. For instance some game characters are “blank slates” if you will, and as you play the game you make it as you want. Other than that just do your research on the character. Understand their behaviour, what makes them tick, maybe their morality or humour, try to understand how they would act in different situations and most importantly analyse their body language. Nyree posing with the EuroCosplay 2016 Champion, Germia from Czech Republic. What would you say to somebody that wants to get into cosplay but is body conscious? I find cosplaying actually helps with confidence, if you are shy don’t let it stop you – try it out and just have fun really, that’s the most important. People will appreciate your efforts and get excited to see their favourite character being portrayed. You will get approached so be ready for that, it’s not something you can do as a recluse (laughs) – you will get attention, but it will be fun. As for a more professional level and if you are serious about competing, then my personal opinion is that you should portray the character as accurately as possible and sometimes the limitations of our body might take away from the accuracy. My personal problem is height, I’m quite short and sadly most of the characters I want to cosplay, tend to be rather tall and/or large! Of course there are ways to give yourself the extra height or muscles etc., but some things aren’t possible for everyone and it might be better to choose a character that’s more similar to your body type if you are competing. Make sure to portray the characters dress code accurately as well and not just how you would like it to be. Do you have a “dream” costume you would like to make? Are there any characters you would love to cosplay in the future? Any last piece of advice for aspiring cosplayers? Start small and just have fun, don’t focus on competitions, explore and expand your talents, practice and you will naturally get better and better. Do you have any final words to share with cosplay and Comic Con fans? Thank you so much for your time Nyree and congratulations once again for this incredible achievement! All the best of luck with your future projects, we will be looking forward to seeing your new costumes! 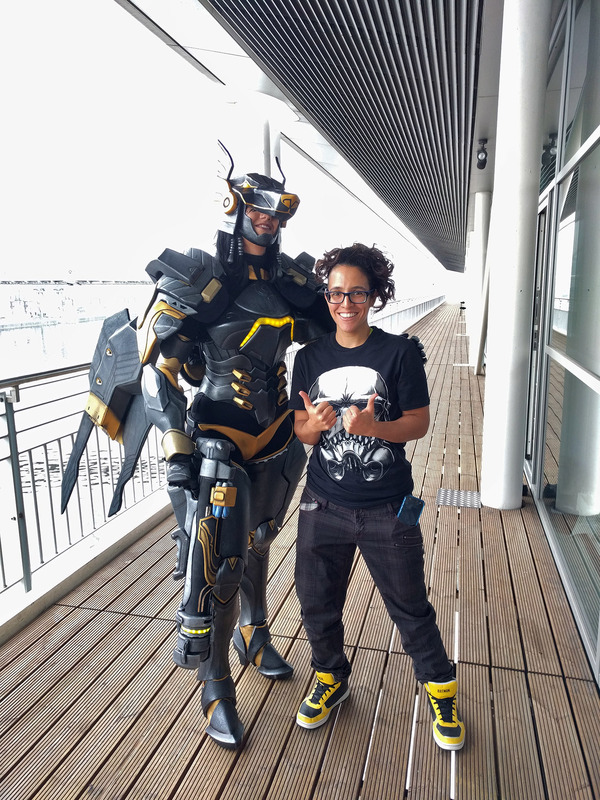 Nyree with our Head of Cosplay, Helen Christofi, who assisted Nyree throughout the entire process!